The election of the first African American president in 2008 spurred a renewed interest in the relationship between prejudice and voting behavior. Many scholars (e.g. Tesler and Sears 2010) argue that Obama’s election provided evidence of racialized attitudes. Recent studies in public opinion have found that latent racism is increasingly important in predicting policy attitudes and vote choice. In a 2010 article, Spencer Piston also shows that explicit negative racial attitudes (holding views that African Americans are lazy, unintelligent, and untrustworthy) explain voting behavior in 2008, but not before. The consensus across several studies is simple: Racial prejudice’s influence on vote choice was triggered by Obama’s presidency. Those who hold explicit or subtle dislike toward blacks were less likely to vote for Obama. But what happens when we begin to expand the definition of prejudice? I conducted a brief analysis of the 2012 American Values Survey which expands the boundaries of prejudice, with three important implications: first, prejudice continues to play a significant role in structuring public opinion and vote preferences in United States, particularly among whites. Second, the scope of prejudice is not limited to anti-black attitudes. A broader measure of prejudice that includes attitudes toward other out-groups turns out also to be predictive of voting behavior. 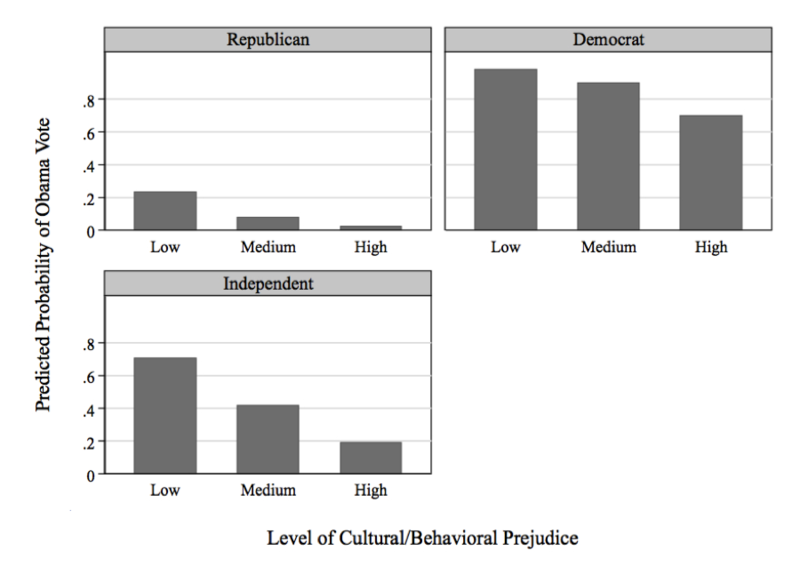 Third, like other measures of prejudice, broader measures of cultural/behavioral antipathy impact Democrats more than Republicans, but independents are impacted the most. After coding all of these responses to range from zero (the least prejudiced) to one (the most prejudiced), I created an index that measures a broader prejudice among non-Latino white respondents. Even though these four items appear to be totally unrelated to each other, the Cronbach’s reliability score of the index is more than .60. This would suggest that there is an unobserved broader measure of prejudice toward out-groups that generates responses to these four questions. I call this index cultural/behavioral out-group prejudice. I conducted regression analyses predicting the likelihood of voting for Obama on cultural/behavioral out-group prejudice among non-Latino white respondents. I also controlled the model for party identification as it is the strongest theoretical and empirical predictor of vote choice. The initial findings are presented in Figure 1. There is a strong relationship between cultural/behavioral prejudice and vote choice. While the predicted probability of voting for Obama among low prejudiced whites is roughly .80—an 80% probability of voting for Obama—it decreases to .16 among high prejudiced people. The dramatic decline in the probability of voting for Obama as level of prejudice increases remains robust even after controlling for party identification. How does this relationship differ across partisan groups? Previous studies show that prejudice affects Democrats and liberals the most in terms of issue attitudes and voting behavior. For example, Piston (2010) showed that negative stereotypes conditioned the likelihood of voting for Obama among Democrats, but not among Republicans. The interactive model, which is displayed in figure 2, confirms earlier findings. Cultural/behavioral prejudice affects Independents the most, and then Democrats. Republicans’ refusal to vote for Obama stems mostly from partisan attachment. The decline in the predicted probability of voting for Obama among Democrats moving from low to high prejudice is more than 30 percentage points. Meanwhile, among religious groups, the biggest decline in support for Obama, when moving from the least to the most prejudiced category, happens among white mainline Protestants and white religiously unaffiliated Americans. 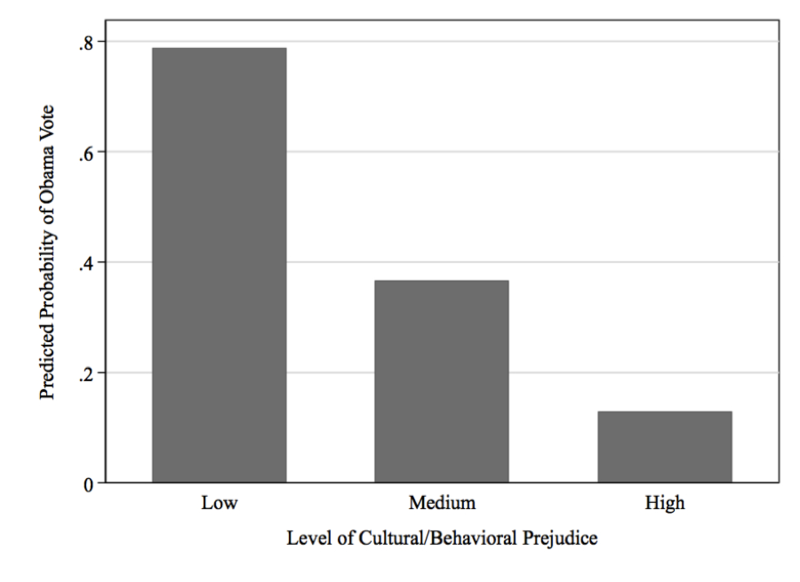 This study shows that prejudice needs a broader definition in contemporary American society. It hits a wide variety of out-groups and minority groups such as homosexuals, people on welfare, and illegal immigrants. Antipathy toward these groups predicts voting behavior among whites as strongly as, if not more than, anti-black prejudice. 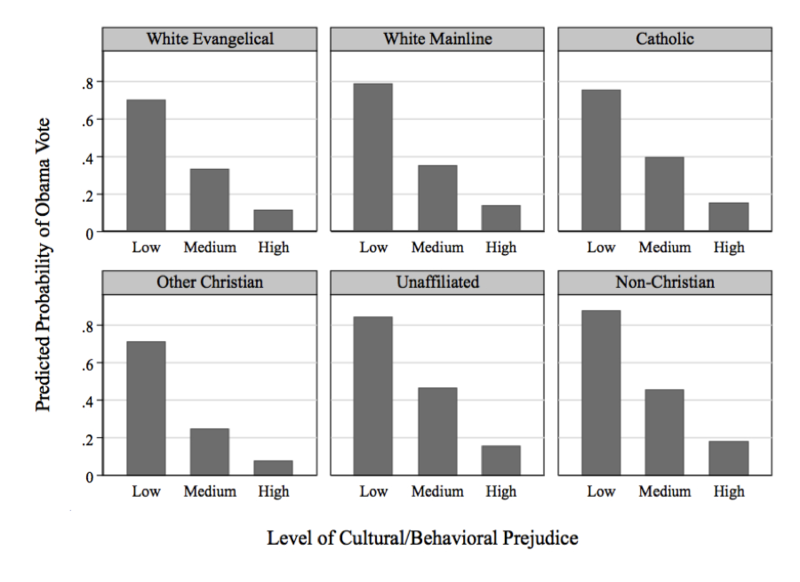 And, the conditioning power of cultural/behavioral outgroup dislike is robust particularly among Democrats, independents, white mainline Protestants, and white religiously unaffiliated Americans.